Dark star safari : overland from Cairo to Cape Town · One Book. One Author. One Hour. Notes on front endpapers, verso, half-title: Grew up in Medford, Mass. Lives Cape Cod half a year/half a year in Hawaii. Mid 60s living in Uganda p 60. Why no photos. Before starting "I had a premonition that I would die," p 380. Had lived in Malawi. P 7 a father. What languages do you speak? How many times have you been to Africa? Joseph Conrad, Sir Richard Burton, David Livingston, Cecil Rhodes, Arthur Rimbaud,. What kind of diary did you keep? Lifelong dislike of Ernest Hemingway. Sudan bomb site. Marcel, Louis sons. Life expectancy in Africa. P.T.-Israel-a window that America sees Middle East p 24. Longest trip of my life--40 yrs ago lived in Limbe/Zomba. Africa--Wonderful people--Terrible government p 38. Flaubert traveling makes you modest--you see what a tiny place you occupy p 45. Read Heart of Darkness twelve times before Cape Town. Travelers-Americans 3 types. Germens men Kurt. Russian resort p 51. Sudan-Clinton's rockets 1998 p 58. Dervishes-Sufis-God is alive. Sleeping naked in the desert, "I was just a white worm in the vastness of a dark desert." Osama-came in 1980s-had found Al Qaeda-kicked out 1996. "Clinton is Satan," p 74. Ramadan--driver guide from Khartoum. Bush is no good. Listened to short wave. What clothes did you wear (sandals). Dongols translated by my brother Peter p 90. Your brother Peter, your sons Marcel, Louis, your mother. Sudan--largest country in Africa. Notes on verso: Sister Alexandra gave ride to Harare Ethiopia. Sussana. Nadine Gordimer--South Africa. Peter Drumnrand's Farm-Zimbawe. Ben and Abel Baker. Helen Full Gospel Church Missionary p 162. Notes on half title: Ch 6 p91 Road to Harare Ethiopia from Djibouti most train in Africa book like they are on the way to Auschwitz. Sister Alexandra- gave me a ride to Harar she had been engaged. Page 117 Men are beasts all over the world. *Statement about Harare--dark star. I was a faranji--a foreigner. I was contented in Harar. Ch 7 p 118--The Longest Road in Africa. Back in Addis wanted to go to Kenya. Ate one meal a day in Ethiopia. From Egypt to Cape Town kids had their hands out. 2 Faranji in a Land Rover went by. Wouldn't give me a ride. Aid workers: oafish self dramatizing prigs and often bastards p. 46. Ethiopia--women have no status. Neiby Makanmen-- exprisoner about fifty 77-87, decided to translate Gone with the Wind--3000 sheets of cigarette foil. Ethiopians are Christians--Halie Salasiee choked to death. *Story of Ali and his wife's affair with soldier p 128. Notes on verso: Chap 9 p 173 still in Nanyuhi in show of Mt. Kenya. Ch 10 Old Friend in Bat Valley p 195. Uganda I do not want to be young again. Highest guest 52. I was just an anonymous man in old clothes. Makerere University 65-68 place of employment. 34 friendship with V.S. Naipaul. That's what happened in Africa: things fall apart p 205. 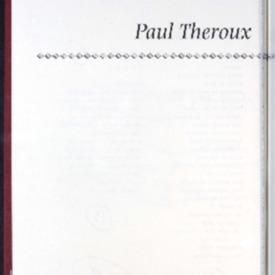 On the Books by Paul Theroux page, Lamb writes the number of Fiction, Criticism and Nonfiction books at the end of each column and then the cumulative total 38 at the foot of the page. Lamb checked all but three of the twenty three chapter titles on the Contents page. At the end of the book, Lamb writes notes on the fronts of the 4 fly sheets, the front and verso of the free endpaper and the paste down endpaper. Notes and underlinings add further details to events/observations/experiences introduced in the front and back matter. Theroux, Paul, “Dark star safari : overland from Cairo to Cape Town,” One Book. One Author. One Hour., accessed April 19, 2019, http://booknotes.gmu.edu/items/show/598. Program air date: May 18, 2003.